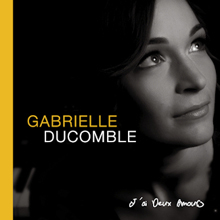 Belgian-born and London-based chanteuse Gabrielle Ducomble is gifted with an irresistible voice. Obvious comparisons can be made (and usually are) to the great Edith Piaf or at a pinch, a jazzier Mireille Mathieu, but this does Ducomble a disservice since she exudes her own unique vocal charm. 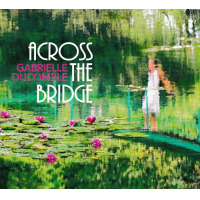 Across The Bridge follows in the footsteps of Ducomble's first two albums, J'ai Deux Amours (2011) and Notes From Paris (2014), remaining stylistically true to form to its predecessors. In common with the previous two albums she is accompanied by master guitarist Nicolas Meier, who has again co-produced the record with Ducomble. "Forest Boy" is pleasant enough but just a little too languid for an engaging opener. By contrast the hypnotically gorgeous "Where Is Home" catches the listener's ear from the very first bars. The placid "Les Terrasses De Riz De Jatiluwih" features violinist Richard Jones's dulcet soloing which adds to the piquancy of the number. There's a substantial gear change on "Ride" where Ducomble delivers the upbeat song with a palpable sprightliness that lifts the set's overall mood. Alluding to the album's title, "Like A Bridge Across Your Heart" is packed with emotion and sung by Ducomble first in English and then, as with several of the tunes here, in French. Another mood swing is presented with "Circus," a cheery nod to Django Reinhardt's and Stéphane Grappelli's Quintette du Hot Club de France. With its bluesy licks, "Is This It?" could easily be a paean to Peggy Lee for all its catchiness. But the majority of tunes are heartfelt ballads, such as "Valse Dans Le Parc" and "Les Nymphéas." The closer is the medium-paced and decidedly heart-warming "Les Roses Et Leurs Épines" with Jones again adding agile violin to this memorable number. Ducomble's repertoire on Across The Bridge is predominantly characterised by cabaret or torch song genres, but that said, the album benefits from wholly original songs, all excellently arranged and executed. Track Listing: Forest Boy; Where Is Home; Les Terrasses De Riz De Jatiluwih; Ride; Like A Bridge Across Your Heart; Tell Me Today; Circus; Valse Dans Le Parc; Is This It? ; Les Nymphéas; The Time Is Now; Les Roses Et Leurs Épines. Personnel: Gabrielle Ducomble: vocals, piano, melodica; Nicolas Meier: guitars, Richard Jones: violin; Nick Kaçal: double bass; Saleem Raman: drums. Plus guests: Bill Mudge: piano; Fausto Beccalossi: accordion.